Thunbergia is a genus of flowering plants native to tropical regions of Africa, Madagascar and southern Asia. Its members are known by various names, including Thunbergias and Clockvine. Thunbergia on its own usually refers to Thunbergia grandiflora, while Thunbergia alata is often known as Black-eyed Susan Vine or just Black-eyed Susan. The generic name honors Carl Peter Thunberg. The species are vigorous annual or perennial vines and shrubs growing to 6.6 to 26.2 feet (2 to 8 m) tall. The vines climb up the nearest support, providing vertical color and natural screening. Water Thunbergia deeply once a week, providing approximately 1 inch (2.5 cm) of water during irrigation or enough to keep the top 6 inches (15 cm) of soil evenly moist. The plants require less irrigation during rainy weather, and they may require twice weekly irrigation during times of dry, hot weather. Guide plant stems to the support once they are long enough if they don’t begin climbing on their own. Thunbergia sends out tendrils that grip the support, so leaning the longer stems against the support forces the vine to begin climbing. Cover the exposed soil in the garden bed with a 2-inch (5 cm) layer of mulch. Mulch retains soil moisture and suppresses most weeds, but pull any weeds immediately that do manage to breach the mulch. Pinch off the dead blossoms after they wilt to encourage the vine to form new buds. Pinch off the tip of the vines and stems to control their height and spread. 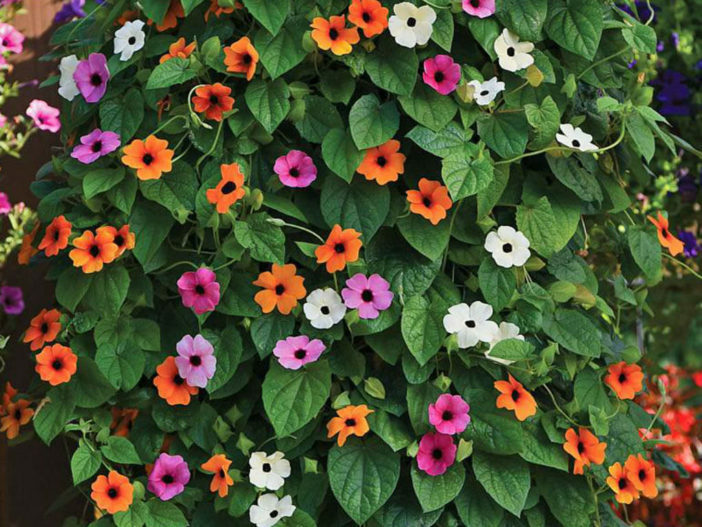 Spread 1 inch (2.5 cm) of fresh compost over the soil in the garden bed each spring if Thunbergia grows as a perennial (USDA hardiness zones 10 and 11) in your area. Compost replenishes nutrients in the soil.